Recently a participant from one of my seminars asked me a question about culture. His company has several teams each running different projects, and he'd like to know how they can go about defining a set of core values to shape their culture. I gave him stories from some of my favorite companies. I think the info would be helpful so I'm sharing it here. Culture is like a platform for teams and companies to achieve what they set out to do. A strong culture ensures everyone is looking at the same direction; it points everyone to the team's purpose. I think we all intuitively understand a strong culture is critical to success. Although we understand the importance of culture, more often than not, we just let it happen. If it's really a priority, we should be proactively shaping it. Or as the culture-driven company known for excellent customer service, Zappos, puts it: we should be deliberate about culture. Core values are like the tent poles of culture; they form the foundation of a team’s culture. Therefore, shaping a team's culture begins with defining your core values. Below I'm going to share with you the core values of three disruptive companies. I hope the examples will inspire your team to define your core values. If your team already has a list of core values, I hope it will spur you to revisit them and make them even more inspiring. Offer an alternative to the overpriced and underwhelming eyewear that was available to us. Build a business that could solve problems instead of creating them. In the culture section of their website, they list the ground rules that shape their culture. The less the better: Warby Parker has 4 rules. Only 4 rules. When you define your core values, you might come up with a long list. Distill the list. Edit it down. The less the better because it means your team will more likely remember it. Use a more friendly term to refer to your core values: Warby Parker uses the term ground rules instead of core values. If the term, core values, seem too business-like for your team, ground rules is a good alternative. It definitely has a more down-to-earth feel. Warby Parker's ground rules should give you some inspirations and hints on creating your own list of core values. Sir Kensington’s is a premium condiment startup from New York that makes delicious ketchup, mustard, and mayonnaise. They aimed to create a category-disrupting ketchup, which eventually got picked up by stores and markets like Dean & Deluca, Williams-Sonoma, and Whole Foods, as well as popular New York eateries. In this post on Medium, they share their thinking behind their mission and values. At Sir Kensington's, we're in the business of selling condiments. But our real secret sauce is who we are, what we believe in, and why we do what we do. For food, there’s no greater complement than a great condiment. Whether it’s ketchup and mayonnaise, or the burger they complete, our purpose is to make food better. Sir Kensington's has four core values that define their culture and business philosophy. We act with honor, even when no one is looking. We make condiments with character. I'm sure you've encountered companies with core values that feel generic. Sir Kensington's core values certainly doesn’t feel that way; it’s got character. The secret sauce to making the core values unique to your team is add a bit of creativity. Play with words and create puns from what you do. For example, Sir Kensington's is in the business of food. So instead of saying something like people are our most valuable asset, they selected words associated with what they do. In this case, they used secret ingredient. To establish a strong identity, they came up with Sir Kensington, a (fictional) merchant who would represent the company's quirky sensibility. Just from the name Sir Kensington, you probably imagine him as a gentleman. This perception sits perfectly with their second core value: We act with honor, even when no one is looking. "Character" is our combination of integrity and charm (as well as the dandy character of Sir Kensington himself). Are there any ways we could play with the words to make them relevant to what you do? Can your brand attributes inspire how you phrase and express each core value? Similar to Warby Parker, Sir Kensington's has four core values - each of them clear and concise. Also note that the language used is simple and human. Acquired by Amazon in 2009, Zappos is an online shoe and apparel store known for great customer service and for being a great place to work. They're a culture-driven company that celebrates their core values everyday. The culture book is a collage of unedited submissions from employees within the Zappos Family of companies sharing what the Zappos culture means to them... Like a yearbook, the Zappos Culture Book is a snapshot of the past year through everyone's eyes. The culture book is just one of many ways they celebrate their core values. Not only do they celebrate them within their company, they also celebrate it with their customers as well. If you visit their website or subscribe to their newsletters, the bottom footer area always features one of their ten core values. While looking through Zappos’ core values, do you notice a pattern? Every one of them starts with a verb. What this means is that each of the core values is explicitly actionable - a very important attribute of a well-crafted core value. For example, let’s say you have a core value about creativity. You can phrase it "creativity," or you can phrase it beginning with a verb like "be creative." Which one invokes action? The latter will have a better chance of coming to life in your team. There is inherent friction from words to action. By making your core values start with a verb, it removes some of this friction. It makes the core value more actionable and more proactive. 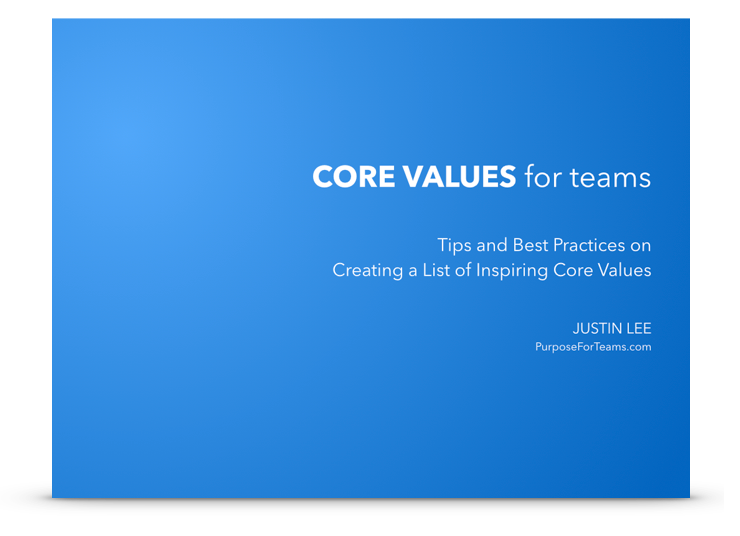 In the next section, we'll take a look at how Zappos actually defined their core values, and derive the steps for the creation of your team's core values. Tony sat down to write the core values. Our CEO said, "We got to do this culture thing." He sat down to write the values, and he said, “I can’t do this.” That’s when he emailed everybody… He is the top, and he tasked everybody on the bottom - from the bottom-up… Our CEO didn’t try to dictate. He saw the need and then said, “Together we can figure this out.” … We spend a year gathering all our responses. We combined the things that were similar. Then we relaunched the list. From the hundreds of values, we got 37 which are the most common themes… from that we distilled that down to ten core values. It took us over a year. Bottom-up: Zappos did not start from the top. They started with everyone in the company, which creates a sense of involvement and ownership. Take the time to get it right: Keep in mind Zappos took over a year to come up with their core values. Take the time to get everyone involved and get their feedback. While we had a strong culture when we started training, we didn't have our values articulated. Fortunately, Tony stepped up by simply sending out an e-mail asking, "Who in our company do you think is really successful and what do they do? What are their attributes?" Tony got all those attributes compiled and asked us to look at a list of about 37 descriptors. In essence, he was surveying us on what we thought our culture was and what it should be. As you can see from Zappos, defining a set of core values is definitely not rocket science. Any team regardless of size can do it. Let's break down Zappos' example. Who in our company (or team) do you think is really successful and what do they do? If your team is big, form a task team accountable for the following tasks and, ultimately, defining the core values. Gather all answers, group them, and find the common themes. Share the answers and findings with everyone and gather feedback along the way. Refine the answers and see if it’s possible to combine some of the answers. Identify the truly important ones. Narrow the answers to ten or less. In the next and final section, I’ll be wrapping things up with tips on narrowing down and formulating your core values. Let's go over four things I've learned from the core values of Warby Parker, Sir Kensington’s, and Zappos. One of my English teachers in middle school introduced me to the the KISS principle. KISS is an acronym for Keep it short and simple. The core values of Zappos and the companies I brought up are all short and simple. By being short and simple, it keeps them more memorable. You want your core values to be remembered. After all, what would be the point if they weren’t? When you look at the list of core values your team came up with, go through each one and apply the KISS principle. Zappos has ten core values. Warby Parker and Sir Kensington’s have four. The fewer you have the more likely people will remember them. In fact, to really make sure everyone can recall the core values, edit it down to three. I have a strong preference for three because that is the stickiest number. You can have three steps, three themes, three strategies, three tips, three techniques, three tools. If you doubt this rule of thumb, consider the following. Everyone knows, thanks to Stephen Covey, that there are seven habits of highly effective people. Can you name them? There are 10 Commandments in the Bible, and the Bill of Rights of the U.S. Constitution comprises 10 amendments. Jake Welch preached the four Es of leadership. Can you name them? Pick three essential core values to start out with. If you absolutely feel the need to expand the list, you can always do it later. Be creative. Play with the words. Make puns. A splash of creativity will help you make the core values unique. Our core values — reach, learn, di-bear-sity, colla-bear-ate, give and cele-bear-ate — can be seen in everything we do. Not only does the playfulness make it more memorable, it also gives you a few chuckles. Make sure every core value invokes and inspires an action. Don’t just have one-worded core values like integrity, honesty, or creativity. Clarify these words. Interpret these words. Elaborate and make it your own. If you or your team aren’t good with words, use the Zappos core values trick - start all your core values with a verb. This automatically transforms the core values into an action. Apply the KISS principle, remember less is more, be creative, and make it actionable; I hope these tips will help you define and articulate the core of your culture. Getting your core values down is just the beginning. Now it’s time to truly embrace them, celebrate them, and keep on celebrating them. To get started with the celebration, I encourage all team members to create a personal ritual to celebrate your core values. For example, a ritual might be to pick and write the core value of the day on the white board in your office. You can go one step further by coming up with a team ritual. For example, you can have a monthly standup for team members to share stories about how they brought the core values to life that month. Lastly, I hope you found this post on culture and core values insightful. For your reference, you can get a e-book version of the contents here by using the form below. Good luck and best wishes on your team's endeavors. If you found the article insightful and would like to save it for reference, we've prepared a PDF version of this article just for that. It's beautifully formatted as a short e-book. Simply use the form below to get your copy. You will receive an email with the ebook from us soon. Thank you.